Rigoberto Tiglao, a Filipino diplomat and veteran writer, in his Manila Times column tackled the P1.2B flood control project that was stopped by former Aquino administration. Tiglao described it as one of President Benigno “Noynoy” Aquino III biggest crimes against the nation due to the misery and adverse economic impact it has caused, affecting Metro Manila. “Blood is even on Aquino’s hands because of the deaths—over a hundred during this rainy season so far—due to leptospirosis, an infection caused by a type of bacteria found in the urine of rats and other vermin spread by floodwaters.” He said. “Aquino’s crime is nearly forgotten now, for which he has not been made accountable, but of which I am reminded with the onset of the rainy season each year when floods make metropolitan Manila a hell for many Filipinos.” Tiglao added. The columnist revealed that former president Gloria Macapagal-Arroyo initiated a project called the Laguna Lake Rehabilitation Project prodded by the devasting two typhoons that hit the country in 2009. “The P19-billion project was all set to be undertaken by the 150-year-old Belgian dredging firm Baagerwerken Decloedt En Zoon (BDZ), world-renowned in that industry and part of the group that built the below-sea-level Netherlands’ canal and dike system.” Tiglao wrote. “The Philippine government practically didn’t even need to put up money up front to fund the project as it was to be financed by a P12-billion loan from the Belgians’ BNP Paribas Fortis bank, with remaining P7 billion to be funded by a grant from the Belgian government — the biggest development aid it would have given the country ever.” He added. “If Aquino had not cancelled that milestone project, it would have been completed in July 2012, and would have significantly reduced flooding in metropolitan Manila as rainwaters could have been swiftly channeled to the Laguna Lake. 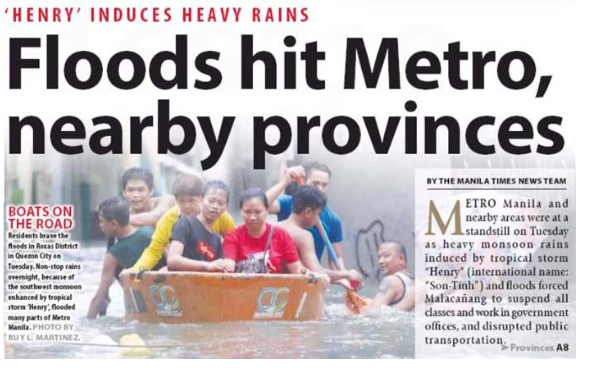 For all of Aquino’s promises that Arroyo’s project would be replaced by new ones to mitigate flooding in the metropolis, no major initiative was made for such replacements during his entire six-year term.” Tiglao said. The former diplomat added that Aquino even claimed the project was a graft-ridden one, calling it a mid-night project of the Arroyo administration. However, even after six years of combing every single document involving the said project, there was no single trace of graft has been found. “That wasn’t surprising: a Congress committee, the Bangko Sentral ng Pilipinas (because it involved a foreign loan), even then Justice Secretary Leila de Lima, and four other government agencies gave the green light for the project.” Tiglao added. Reportedly, even the then Belgian Prime Minister Yves Leterme appealed to Aquino and vouched for the project’s integrity, who also submitted an independent evaluation of the project. Then after months of trying to convince Aquino to continue with the project, the Belgian firm gave up and sued the Philippine government in October 2011 before the World Bank’s International Center for the Settlement Investment Disputes (ICSID), which made the Aquino administration to pay P420 million for the legal fees of the US law firm that handled the case. The Belgian firm asked for P4 billion for the damages, then ICSID, after not finding any indication of corruption in the project ordered the Philippines to reimburse the P700 million the Belgian firm had already spent for the project before it was stopped, then another P40 million for its expenses to hear the case. During the case hearing, the Aquino administration hired US law firm White and Case to handle the case. “The Commission on Audit (COA) said that the Aquino government had violated regulations for having contracted the law firm’s services without the COA’s and even the Solicitor General’s authorization. The COA, however, did not report the amount of fees paid to the late former Justice Florentino Feliciano, whom the Solicitor General contracted as its attorney to represent it in the ICSID, which I am told could have amounted to at least P20 million.” Tiglao wrote. “In sum, government – we taxpayers – spent some P1.2 billion for Aquino’s irrational move to stop on his own—without any other government agency or even a court supporting him that decision—a project that could have mitigated the yearly flooding in the metropolis.” He added. “Aquino’s stopping of this flood-control project certainly ranks high in the crimes he has committed against the nation.” Tiglao also said.